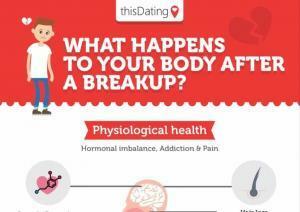 What happens to your body during and after a breakup? Although there are many things to consider after breaking up with someone, the single hardest thing to deal with is how to get over someone and that is one of the main things we focus on in this guide. We’ll cover many things including some of the physiological changes that are happening to your body. Many things are occurring that we don’t even realize – and they affect us in some startling ways. The amygdala is perhaps the most primal part of our brain. It is responsible for setting off our ‘fight or flight’ reflex. This is the signal to our body telling us if something is too dangerous to stay and tackle it or if we should run away and live to fight another day. Even though breakups in most cases are not life threatening, they can still be the cause of a lot of stress. This triggers the amygdala to release a multitude of hormones and signals to your brain and your body. This also basically floods your system with all the negative emotions and feelings that are present during the breakup. The result of all these hormones and imbalances in your brain and body will leave you with all the negative feelings you get. The reactions going on in the amygdala can cause us to act irrationally and in some cases dangerously. If you’ve ever found yourself stalking an ex or acting obsessively then the Amygdala may be to blame. Many of us hear the term A.S.B.O. (Anti-Social Behavior Order) and immediately think about sulky teenagers, but did you know that many of us become the very thing we dislike after a breakup? Anti-social behavior is very common during situations of sadness and pain as people act out their emotions with very little control. Sometimes it’s done by abusing those that are trying to help you. (Fighting with them etc.) Or sometimes it may be the extreme version whereby you may scratch your ex’s car door or break the windows of their house. While this is obviously not acceptable behavior it is explainable. Have you ever tried to put in a day’s work while going through a break-up? Anyone that has just broken up with their partner may have a hard time dealing with their daily routine in the workplace. Studies have shown that people experiencing breakups are far more likely to take days off work depending on how severe their mood swings are. Those that do still manage to drag themselves to work often have decreased performance and lack the will to do the job to their boss’ expectations. This can lead to reprimands from the boss which leads to more stress – and the cycle escalates. Studies have shown that breaking up can also cause a body to have a severe withdrawal reaction similar to that of a drug addict going off drugs. Because the body is so used to relying on a partner it can actually go into shock when that “supply” is cut off, causing symptoms like the shakes and nausea. These withdrawal symptoms can lead to us reaching for something to replace the craving and help us to cope. If you’d like to know what the most popular coping mechanism is, then check out the full article on how to get over someone after a breakup. It discusses the use of alcohol, drugs, or food to cope with your loneliness and the many alternatives you can use to keep yourself sane and healthy and believe it or not, “retail therapy” is not the top answer amongst people that were surveyed after a break-up. In the end, all you need to remember is that you’re not the first to go through this – and you won’t be the last.